A great ginger tea that’s an original ayurveda blend. Contains lemongrass, ginger, citrus peels, liquorice, peppermint and pepper. This is a tea that scared me a little at first. I love all the ingredients individually, and I love many of them in blends, but having tried at least one licorice and peppermint blend that I didn’t like (and, in fairness, I should mention that there is at least one that I can recall that I did enjoy), seeing that these two ingredients were on the list worried me a little. I mean, I love licorice. I love peppermint. But together in one tisane? I was skeptical. The flavors here are all so very assertive, and yet the cup itself is not off-putting or overwhelming. It is a strong yet tasty tisane. I think that it is the assertiveness of the ingredients that really makes this flavor combination work! I think that if there was an ingredient here that was a little less than assertive, it would be overwhelmed. As it is, the flavors here are bright, strong and vibrant. The ginger is the first flavor I taste, and I don’t know if that is because it’s the first flavor that I expect. The ginger is nicely accented with the black pepper, and these two warm ingredients really spice things up nicely here. The lemongrass seems to soften the edge of the ginger, giving the cup a sweet and somewhat creamy taste. The citrus peels seem to enhance the lemon-y taste of the lemongrass just enough to make this a very pleasing, citrus-y tasting tisane. Because of the strength of the ginger, citrus and black pepper, the licorice and peppermint don’t really have much of a chance to come off as repellent (and that is a VERY good thing!) Instead, they act as highlight flavors, offering just enough of their distinctively zesty flavor to the cup when needed without overwhelming the balance of the cup. This is a tisane I enjoyed much more than I thought I would. It is smooth but with a lively, zippy flavor that really grabs my attention. It is delicious and sweet and quite soothing after a spicy meal (I had some rather spicy tacos tonight!) I am finding that this cup is just what I needed after that! Contains ginger, citrus peels, liquorice, peppermint and pepper. Ginger. Where to start!? Ginger and I have a back and forth sort of relationship! Some call me Ginger because of my Red Hair…and that’s fine, I suppose. I LOVE Ginger in most foods. 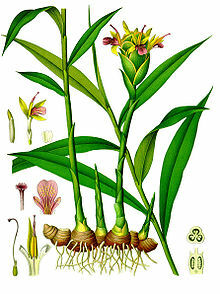 Ginger in teas and tisanes!? Well, that’s where it seems to get complicated! Most of the Ginger Flavored Teas and Tisanes I have had aren’t really on my LOVE or even my LIKE list. It seems most of the flavoring is overdone and/or cancel out the other flavors in the blend or mixture. Sometimes it tastes too herbally or chemically or just spicy or peppery and nothing else! So, yeah…I guess you can call me PICKY when it comes to Ginger-Type Teas and Tisanes! Every assumption and thought I had holding me back from having a cup I am now completely throwing out the window! This was a complete surprise and in a good way! It proved me wrong in every way and I certainly don’t mind being proved wrong if the end result is a tasty tea/tisane! The Lemongrass totally evened that out…both the lemon grass AND the ginger are gentle yet flavorful and pair well together! I wouldn’t change the ratio any…it’s good the way it is! I can’t really smell the licorice but I can taste it a little bit and with the licorice and the pepper pairing they also work nicely together and are subtle…again, thanks to the lemongrass. I can smell the peppermint but the taste of the peppermint really isn’t the flavor in the forefront…it’s just enough to be there – in comparison I would say a little less than the licorice. Maybe moreso in the aftertaste. This is very different yet quite good and I am so pleased it’s NOT ‘run of the mill’ and even more so excited that it’s more than just ginger!